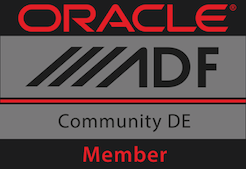 There was an Oracle Developer Day on 24.01.2013 at the OOP in Munich. I went there to tell interested people about the advantages and obstacles of ADF mobile. Most of them were fascinated about the smooth and easy way to develop cross plattform apps with this framework. Especially in the hands on session. While there is still a lot of room for improvements, this framework is already a real pro for ADF as a whole. Thanks to everyone who attended at the OOP. Unfortunately the slides are in German. Maybe I'm going to post a English version too.